The Plateau Boulders in Rocklands have seen a lot of action lately and it seems that everyone is lining up to send the area's testpieces. Clinton Martinengo, Jon Reading, Marijus and Edvinas Šmigelskis, Scott Noy and Marc Efune all sent "Weichei" 7C+. Clinton Martinengo flashed "Louder Than Bombs" 7C and "Arch Baby" 7C, and Scott Noy did "Shadows of Ourselves" 7C+ at Kleinfontein. 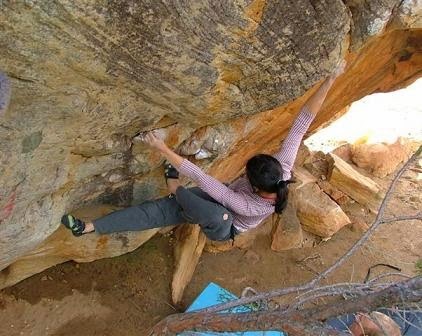 Julia Chen sent the super crimpy "Model Robber" 7B as well as "Teapot" 7A at the Campground Boulders. "Born Into Struggle" has also seen a lot of ascents, including a flash by Marijus and a consensus has been reached to downgrade the line from 7C to 7B+. Dale Posthumus is making a return to bouldering and repeated "Sunset Arete" 7C in a single session after having tried the problem briefly a few years ago. At TDA on the Deadwood boulder, Marijus Šmigelskis added an excellent new problem called "Parthenon" 8A. It starts as for "Hip Hip Chin Chin" and then moves up and left through the steep wall using the big moves off small crimps to join "Xibalba". At the main boulder, Monique Harris dispatched her project and sent "Skunk" 7B, and Julia Chen got the first lady send of the crimpy sit start dubbed "Super Skunk" 7B+. At the Roadside boulders in Rocklands, Julia Chen has probably become the first South African lady to climb the notorious "A Question of Balance" 7B. Although she got close to climbing the problem in one day, the moves took their toll and she returned send it on her next trip. Ben Harper and Marijus Šmigelskis also made repeats of the Roadside classic "Pendragon" 8A. Julia on "A Question of Balance"
Martin Renz has been active in the Eastern Cape and has added a bunch of new problems to the boulders of Alicedale, the most notable being "Yoma Yoki Direst" and "Afterglow" both 7B+. 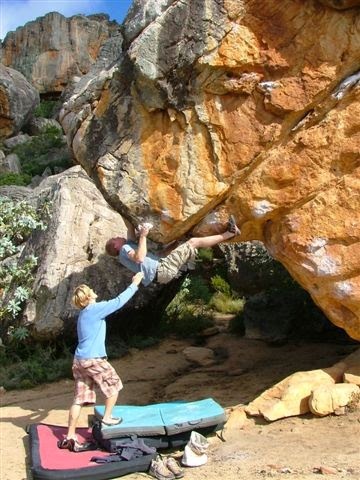 He also repeated "Raptor" and "Joe Lives" both 7C in Hogsback.